Driving a truck may be one of the most critical and dangerous jobs in the world. Successful truck driving requires caution, expertise, and stress management skills. As a profession that regularly makes the “ten most dangerous jobs” lists, trucking is not easy, though it is a very rewarding career. With that being said, here are a few safety tips to use when driving fleet trucks. One of the most essential tips for any truck driver is to make sure you are taking good care of yourself. Ensuring that you are alert, quick to react, and comfortable can mean the difference between success and disaster. Make sure that you’re getting enough sleep, eating healthy, and getting enough exercise between hauls to help maintain your body and mind. 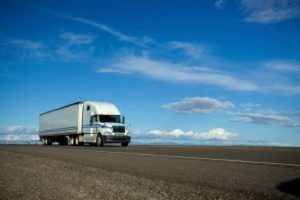 When you’re cooped up in a truck for long drives, having the backlog of rest and exercise can be a massive help to ensuring you stay comfortable. In the winter especially, you must adjust your driving to prevent accidents. In general, it’s recommended that you slow your speed by ⅓ on wet roads and by ½ on icy and snowy ones. Additionally, in these poor weather conditions, be sure to signal for longer to allow others on the road to be aware of your intentions. When a curve is taken too fast, fleet trucks can be prone to topple due to its top-heavy nature. Slowing at curves can prevent accidents and prevent cargo damage. It’s important to note that often the posted speed warnings for curves are aimed at cars and smaller vehicles, truckers should take note and proceed at a speed lower than posted. When you are not working with a full truck (and even if you are) ensuring that your cargo is evenly distributed can help ensure that you are running in a more fuel-efficient and economical way. By keeping cargo stacks low, you’ll ensure that the drag on the truck isn’t as powerful. Every morning, or whenever you choose to start, you must do a routine check to ensure that your truck is in good working order. Mirrors, horns, fluid levels, lights, and breaks should all be checked regularly and kept in perfect working order. Ensuring that you’re up to date in your maintenance can help make your truck last longer and run safer. Every truck has its blind spots. While most motorists know about these no-zones, there are those who will approach them for a variety of reasons. Despite the frustration, it is essential always to exercise caution when changing lanes and turning. This entry was posted on Friday, December 7th, 2018	at 8:08 pm	and is filed under Trucking Lifestyle	. You can follow any responses to this entry through the RSS 2.0	feed. Both comments and pings are currently closed.